That is a picture of Mumbai Dombevilli Station. Do you see the tracks in between. If you cant see them, then you are witnessing the heaviest rainfall in Mumbai. 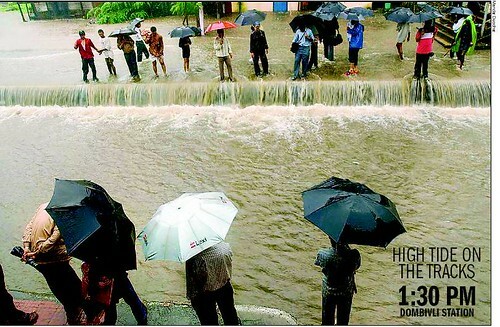 Thats so devastating that it has taken Mumbai Life to a stand still. My project mates in their offices are still in office, and no way back to home, for the past 2 days. 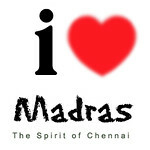 Is Chennai anywere closer. I dont think so. so sad man.. it seems this rainfall set a record for the heaviest in a day.. 37.1 inches.. in a day!!!!!. in arizona, it rains 1-2 inches a YEAR. iyarkayin seetram.. but what is more ironical is, it is because of man's arrogance to natrl. resources which is causing all this. Our prayers to all our bros and sis there. hmm.. you know what Deepak.. still my friend is stranded at office. 3rd day. but this kind of rain is usual in Mumbai. only its a bit stronger this time.